Obsession might be too strong a word, but close. I suppose my daughter remembered when her mother sat glued to the TV in 1991 listening to Hill tell her truth to the “hill.” And her mother is still talking about it. Then it was a brave new thing for a woman to do. It still is. -Rosa Parks (1913-2005), the quiet woman/civil rights activist, who, in 1955 in Montgomery, Alabama, refused the bus driver’s order to give up her seat in the black section of the bus to a white passenger, and catapulted a movement, already in the wings, onto the national stage. There are no rights without duties, and Parks didn’t do her “duty” and was arrested. - the Rt. Rev. 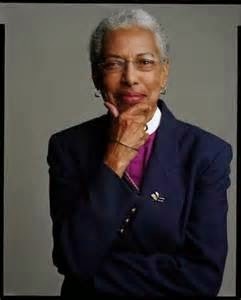 Barbara C. Harris, first Anglican woman bishop in the world, consecrated in 1989 as Suffragan Bishop of Massachusetts, who, though urged to do so, refused to wear a bulletproof vest and jumped-started the institutional church into its next right move toward gender equality. A comment, about a contraption like the vest doing nothing for a woman’s physique, has been attributed to Harris. If she didn’t say it, she probably thought it. -Anita Hill, attorney and retired professor at Brandeis Law School, who, when summoned in 1991, agreed to testify before the Senate confirmation hearings to approve Clarence Thomas as a Supreme Court Justice. Hill told the truth about being harassed by her one-time boss, and gave rise to the issue we now call sexual harassment. Damn, I wish I’d said that to the church when I was questioned about being a mother and a priest! It may be that these stories, such a stretch for my well-honed white Anglo-Saxon privilege, made me weep, touched my heart so deeply that I knew that this was the stuff of everlasting heroism, something to follow. I call such heroics, spirituality: when something taps into my core, where I believe God dwells, and makes me explode. Pow! Then I shout or write or turn activist in my way. True heroism is when the message inside a personal moment of truth bears truth beyond the one who experiences the moment. It’s a pay it forward phenomenon. You can see it in the Hebrew prophets and the gospel messages in the Christian testament. Hill speaks about her decision to “leave home” to write her book, Speaking Truth to Power. She had been so traumatized by the harassment (my word) she received from the all-male squirmy panel of senators when she told the truth about experiencing her own sexual harassment from Thomas, that she couldn’t wait to get home. Home meant the bosom of her large supportive family in which she thrived as the “baby sister,” youngest of thirteen. Home also meant her state: Oklahoma where, she said, white and black culture coexisted in a way that honored the past while simultaneously living into a new kind of future. Home meant she would be cradled, both privately and publicly. Home meant being affirmed, even cheered— and a place to heal. But home, as necessary as it was to Anita in 1991, couldn’t last. 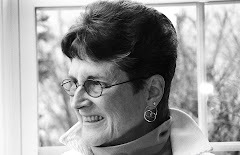 She discovered that it was sheltering, and also limiting—too protective a climate in which to launch a book, advance her academic career in law, social policy and women’s studies up north at Brandeis, and continue to fuel what she had started. (She has written a book on this topic, Reimagining Equality: Stories of Gender, Race, and Finding Home. “I found my voice in 1991, and I won’t lose it,” she said. “What caused me to be fearful, my testimony, was the right thing to do,” she answered. How does one know what the right thing to do is? You don’t. There is only conviction with passion—and doubt. It helps if your one voice in the crowd is echoed by other voices from the crowd, even if they are few, and even if they are faint. I believed Anita, too. I still believe Anita. It’s hard to watch and listen to her and not believe her. It was harder then to listen to Thomas pulling the racial discrimination card to defend himself as if he were the real victim here. The issue was not race, it was gender! I believe in my daughter, who tolerates my obsession, and who is a gifted lobbyist for legislative justice for labor. I sense her conviction about justice is more than a job. I call the film, 'Anita' a miracle unfolding. The late Anglican theologian, the Rev. John Macquarrie defined a miracle as something unstoppable that happens for which we feel surprised and grateful. Or . . .I wonder? Could a miracle also be something God is doing all along but of which we suddenly become aware—and appreciative.